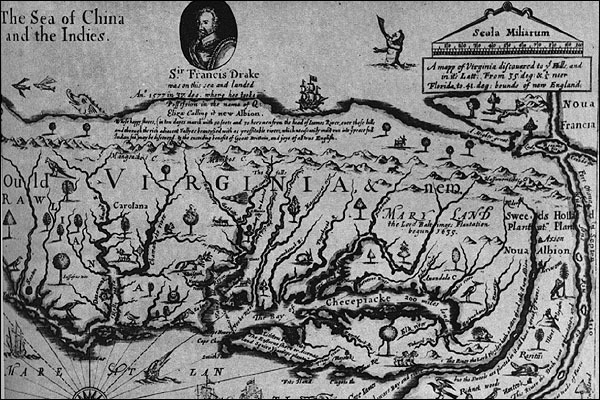 The Jamestown Experience: John Farrer's "A mapp of Virginia"
John Farrer's "A mapp of Virginia discovered to ye Hills" was originally drawn in hand and included in Farrer's personal copy of Edward William's Virgo Triumphans: or, Virginia richly and truly valued. The engraved version was included in the third edition of that book published in 1651. Farrer was a prominent member of the Royal Company of Virginia and an ardent promoter of the new colony. He even named his daughter after the colony. Farrer's map is significant due to the narrow depiction of North America with a Northwest Passage shown as a river connecting the Hudson River to the "Sea of China and the Indies."